Last month, Suz, of Sewpony invited me to go glamping. Or at least to make something from the new Wanderlust Glamping pattern collection by Willow and Co. If your time behind your sewing machine precludes you from being up-to-date on the latest pop culture references, as it does me, 'glamping' according to Dan means glamour camping... or glamorous camping if you ask urban dictionary. I'm kind of ashamed to admit that I don't really like camping. We love spending time outdoors. We love hiking as a family. We have a fire pit in our backyard, in which we love to make fires. (By we I mean Dan. I am in charge of the very important duty of marshmallow roasting.) We own a black lab and a Subaru. We should like camping. But I don't care for sleeping in a tent. Not at all. Even with an air mattress (I know!). And especially not in my current 28 week pregnant state. Here's where I agree with Tara and say I find having my own picture taken to be painfully awkward. Regardless, I do love this collection of patterns, which you can find here. Oh, that Elm Raincoat Poncho! If only we lived somewhere where it rained! I was mesmerized by the photography in the lookbook which made the patterns really come to life. 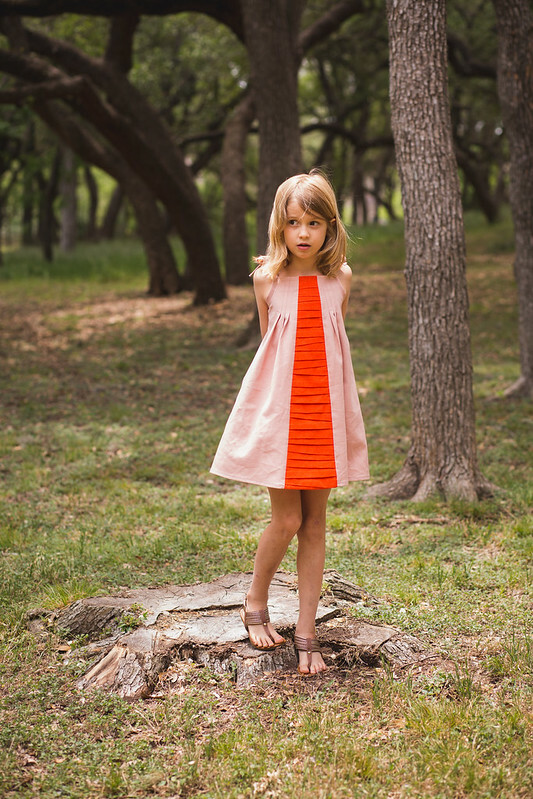 I chose the Persimmon Dress by Hayley of Mouse House Creations. Hayley also designed the Caroline Party Dress which I made here. I am new to her patterns but so happy to have found them. I love her style so much! For the center panel, I used An's improv pleating tutorial, which was so easy and fun. Not surprisingly then, I also spent quite awhile trying to find this orange. I wanted an orange/red. It's a faux linen. I used a faux linen here, too. It's easy to work with and I love the look! But it doesn't have the same drapey-ness as regular linen. That was okay for the center panel, though. Next time, I'd add a few more inches to the length of this pattern. Indigo is so tall! I took her chest measurement and sized down to get the right fit, but I did not take the final dress measurement. I just cut this in the size 7 being she just turned 7. I should know better by now! Tarikua, however, is on the small and shortish side, so this dress will fit her perfectly when the time comes. And I do love how Tia looks in pink. Thanks, Suz, for inviting us along! Suz also asked Marta from Doguincho to make something from this collection. She is sharing her lovely creations for her beautiful daughters here today. Stunning! The pleats make this even more glamourous. I love the color combinations too. Thank you sooo much for joining in the fun with us. And I have a feeling you would love glamping! 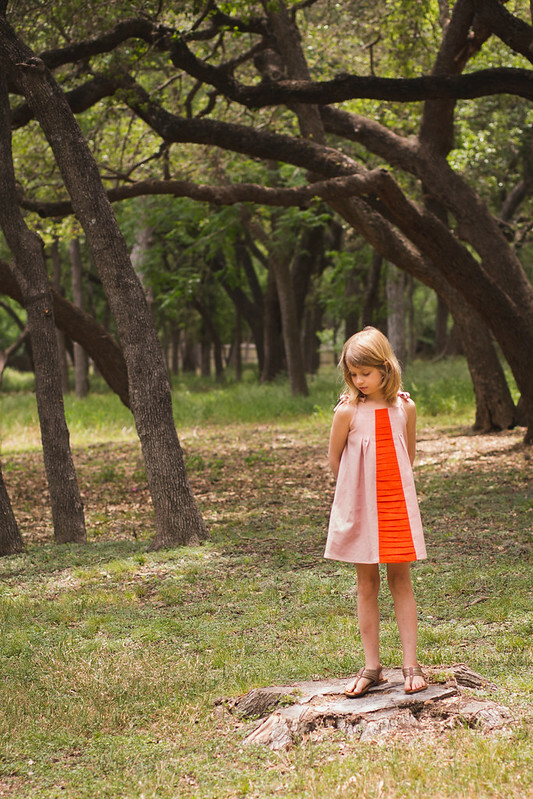 Ohhhh my gosh your version is so so stunning and so is the photos and your daughter (and you from what I can see on the photo :-) You are right, that pink is PERFECT and paired with the orange.....oh la la, I am in love. And I am with you regarding camping....glamping here we come! A down comforter! I love it! Such great suggestions! But, yes, I am with you, no camping this year with a new baby. Not even glamping. ;) I can't believe your baby is due so soon! I'm so excited for you, Shannon! Your persimmon is gorgeous and so are your photos! You look great at 28 weeks pregnant! Congrattulations! the dress is perfect, photos looks so great and you make 28 weeks look like a piece of cake. woo hoo for 3 trimester! You are not glamorous? Haha, WRONG. You are glamorous, miss Rachel. And you have such an eye for designing children's clothes. I'm so often wowed by the colors/fabrics you put together. That pink is an awesome shade. 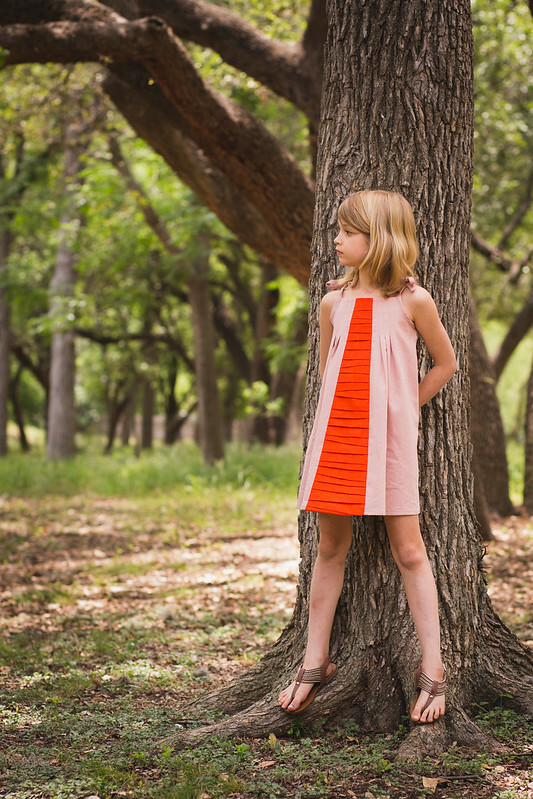 It's great contrast to pair it with the bold and improv pleated red/orange. This dress is gorgeous. Wow. The colors! Supertaster/Supercolorvision! I totally get it. I only like pink if it has a nice amount of peach in it - I dislike hot pink or bright pepto-bismal pink, but I like a peachy rose. So I hear you! I feel very strongly about color too! You have an amazing eye, though, I would not have thought to combine this soft and toned down pink with bright red-orange! Surprising and brilliant! Literally, brilliant, jumps off the screen and grabs you. I am seriously blown away with your dress, and pictures, and everything!! Thank you so much for joining us on our tour and creating such a beautiful dress! Thanks so much, Hayley! I really love this pattern! Your dress is gorgeous and your daughter is so lovely. My word, what an amazing dress. The colours are an exquisite combination and the pleating, WOW! I'm speechless. When I saw the it on Pinterest I was convinced it was a designer dress, then flabbergasted to find out that you made it. I am totally inspired by your creations and I'm still gushing over the Caroline Party dress. Ahhhhh it's so beautiful, Rachel. 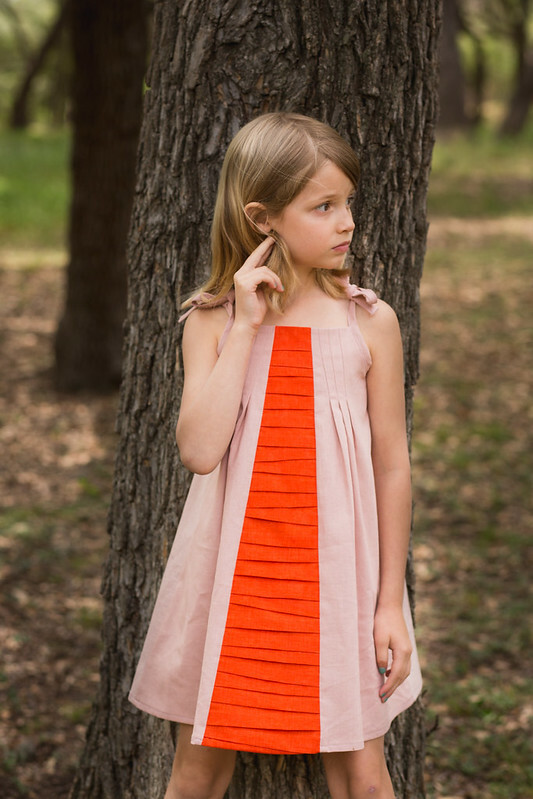 Love those colors together and love the improv pleating - perfect use for it! This is so gorgeous! Those colors look perfect together! I read the improv pleating tutorial too and this was such a creative way to use it! Thanks, Meghan. 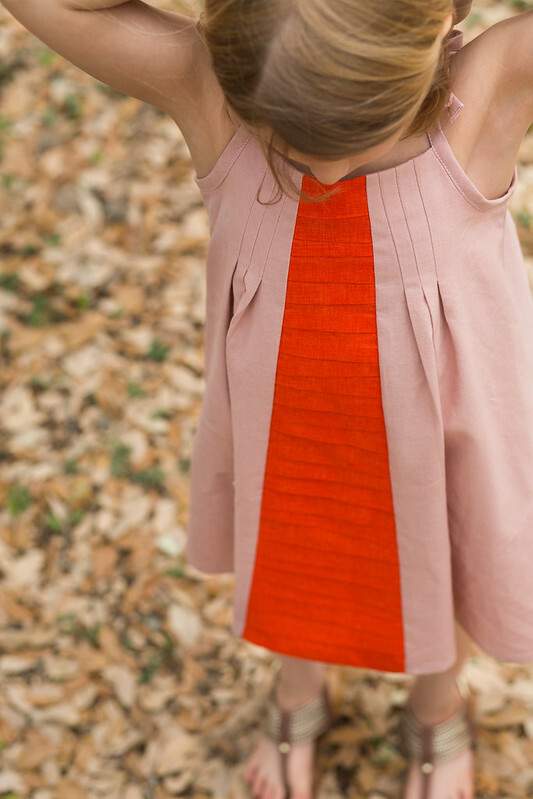 I'm not sure if you've had a chance to try the pleating yet, but it really is easy and so much fun, too! You're just my fave, Rachel.... amazing. So simple, yet interesting. And so lovely!! So if you ever win a holiday to one of those amazing glamping sites somewhere beautiful in the world, you can send it straight to me! You and Indigo both look stunning. The dress is divine and the scenery and photographs superb. I would never have thought of those colours together either but you nailed it. 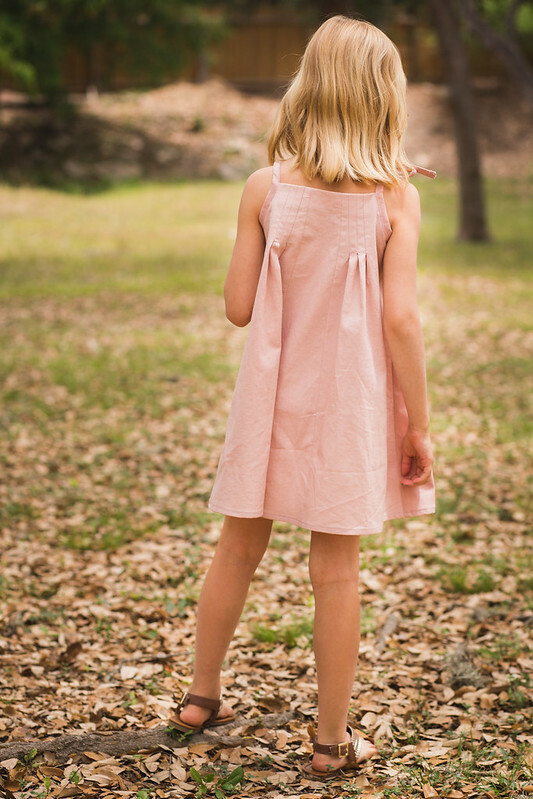 this dress is beautiful and one of those times I think your version sells the pattern better than the photos on the pattern site. No offence to them! Thank you so much! That is such an enormous compliment! Those colors are GORGEOUS together!! Great eye, Rachel! I waffled between this pattern and the Aster cardigan forever (allowing myself to only buy one), and ended up with the cardigan, but now I"m wondering if just perhaps I "need" both:) Beautiful job! Wow- that is stunning! What a beautiful dress. The pleating down the center is the perfect touch. And last summer we went camping while I was 8 months pregnant and I can say it was darn uncomfortable to sleep in a tent while that huge! I also looked up the nearest hospitals just in case I went into labor early. Do any of the parks around you have yurts or cabins? We've visited some Washington and Oregon campgrounds that have these in addition to tent spaces and, while not glamorous, they were quite fun! Wow, this ia an awesome dress!